The Ascendo DataVault Desktop has many of the same features as Ascendo DataVault for BlackBerry. In addition, Ascendo DataVault Desktop provides advanced browser integration with Internet Explorer and Firefox. To start the DataVault Desktop, click on the Start button in Microsoft Windows, then click on All Programs. If you installed the DataVault Desktop correctly, you will see a submenu for Ascendo DataVault. Move the cursor over the DataVault submenu and several choices will appear. User Guide: Opens a PDF version of the DataVault User Guide. Ascendo DataVault: Starts Ascendo DataVault Desktop on your PC. Web Site: Goes to the DataVault product page of Ascendo.com. Uninstall: Removes DataVault from your PC. When you start the DataVault Desktop for the first time you will be asked to choose a password and then retype it. If you plan to synchronize DataVault items between your BlackBerry and your Desktop, you must select the same password for both. On subsequent start-ups you will be asked to enter your password just once, see Figure 16. The password in Figure 16 is masked, meaning that an asterisk "*" appears in the place of each character that you type. This is done to protect you from individuals who may be close by and looking at your screen while you are typing your password. If you uncheck the Mask box, the characters you enter will appear as they normally would. The Keyboard icon starts an on screen keyboard that you can use to type your password using your mouse to select characters, see Figure 17. Enter your master password with the screen keyboard safeguards you from key logger software that may be installed on your computer. Key loggers record each keystroke that you enter on your physical keyboard. Hackers and identity thieves use key loggers to obtain confidential information. Key loggers can be installed on your computer in same way as viruses or spyware. When you use the screen keyboard, key loggers record mouse clicks instead of characters which are useless to hackers. The Reset option should not be used unless you forget your password and are unable to retrieve it. If you click on Reset all the data in DataVault will be deleted and you will be asked to select a new password. You can set-up a Password Hint to retrieve your password in case you forget it. A password hint is a question and response that you choose. For example, you could enter "What was my first pet's name?" as the question and "Lassie" as the response. If you click on Hint in the password window, DataVault will display the hint question and ask you for the hint response. If you answer the question correctly, DataVault will display your password. The first time you start DataVault, the Hint option will be grayed out. You can only set up a hint once you have chosen a master password and used it to start DataVault. 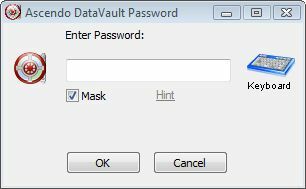 To create a password hint, click on Tools then Set Hint from the DataVault Desktop menu. To start Ascendo DataVault Desktop, click on the Windows Start button, then click on the Ascendo DataVault submenu and select Ascendo DataVault from the list of choices. Alternatively, you can click on the Ascendo DataVault icon from the Windows desktop. Once you have created your password, the initial Start-Up Screen will be displayed, see Figure 18. The cursor will appear next to the Search label at the top of the screen. You will see a sample Email and Visa Item which you can edit or delete. The item details for the highlighted row in the left hand panel will appear in the right hand panel. When you enter characters into the Search field, the list of items will be reduced to display only the items that contain the string of characters you entered. See chapter on desktop List View for more information on searching for Items. You can resize the application window and panels. If either of the panels is resized so that they cannot display all the information contained in them, slider bars will appear along the right and bottom sides. The top row of buttons perform the following functions. Add: Create a new item. List View: Switch to List View from Tree View. In Figure 18 List View is already active so the List View button is grayed out. Tree View: Switch to Tree View, see section on Tree View. Passwords Generator: Open passwords generator screen to randomly suggest passwords based on several user settings. Templates: Add, Edit or Delete Templates with default field labels for items. Categories: Add, Edit or Delete Categories like Business, Personal, etc. Types: Add, Edit or Delete Types like, Credit Cards, Logins, etc. Keyboard: Open screen keyboard to enter characters with mouse instead of physical keyboard. Help (not pictured above): Open User Guide in PDF format. The drop down lists for Categories and Types, below the search field, allow you to filter items. If you select Business from the Categories drop-down list, only items with Category set to Business will appear in the list. Set Categories and Types to All to show the entire list of items. You can drag the Category and Types tool bar to position it above or to the right of the Quick Search toolbar. The bottom row of buttons perform the following functions. Logout: Remove application window from view and display password dialog window. Duplicate Item: Create a copy of the current item. Hide/Show Details: Toggle between displaying the right hand details panel and removing it from view to maximize the available screen space available for field columns, see Figure 19. Save Template: Save icon, field labels, category and type to reuse when creating similar items. Save Item: Save current edits to an item. Cancel: Cancel current edits to an item without saving. In the panel on the right side of the screen you will see the icon, category, type fields and notes for the highlighted item. To display the details for a different item, click on another row in the left hand column or use the arrow keys to scroll through the items. To edit an item, click on the Edit button at the bottom of the screen. You can also switch to Edit View by selecting File > Edit from the screen menu or by using the shortcut CTRL-E. Once in Edit mode, you can modify all of the item information in the right hand panel, see Figure 19. The Select Template field contains a drop-down list of 20 predefined item formats such as Bank Account, Login or Visa. A Template includes a default icon and up to ten field labels, see section on using Templates for more information. The example above displays an envelope icon which appears to the left of the item in List View and as a large icon in View Mode. You can change the icon by clicking on the arrow key to the right of the icon. There are 100 icons to choose from. The Item name, "Email (example)", is highlighted as soon as you switch to Edit mode. Start typing to clear the sample item name and enter a new item name. Field labels (left column) and field values (right column) can be found directly below the item name. There are there are ten fields for each item and a notes field that is off the screen in Figure 19. You can use several editing features with the notes field such as carriage return for new line, word wrap and cut & paste. There are two buttons to the right of each field. The first button copies the field value (right column) to the Window's clipboard. From there, you can paste it into other Window's applications. For example, you could copy a username or password into a browser form. The second item is the mask button which will change the contents of the field value to asterisks ("*"). Masking a field provides an extra level of security in case somebody is able to see your screen while you are using DataVault. You can select a Category or Type from pull down list that appear beneath the item notes to filter the items that appear in the left hand column. You can also edit item names and fields in the left hand column by clicking once to select a row and again to switch to edit the field value. When you are done editing, click on the Save Item button below the item value column to save your modifications. Your updates will appear in the left hand column. Click on the Cancel but to ignore your updates. Clicking on Save Item or Cancel will return you to list view. To Add an Item, click on the Add button at the top of the screen or select Edit from the screen menu option, then click on Add Item in the submenu. The right hand panel will switch to a blank item form. If some cases, you may have already saved a record that is similar to the new one that you are about to create. You can duplicate an item by scrolling to the item in the left hand column and clicking on the Duplicate button. Alternatively you can select Duplicate from the screen menu or use CTRL-D as a shortcut. Duplicating an item will create an exact copy with the string of characters "(Copy)" next to the file name. When adding an Item, the Category and Type default to Unfiled. You can reset the Category and Type using the drop down fields at the bottom of the details panel. To Delete an Item, click on the Delete button at the top of the screen or select the Edit menu option then click on Delete. 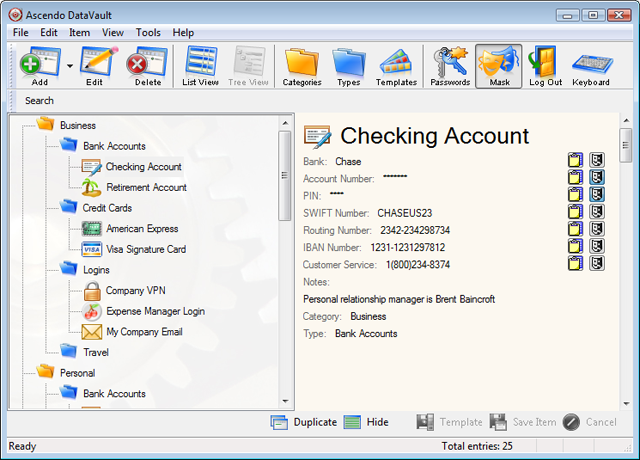 As an added security measure, DataVault creates a log of deleted items accessible from the Tools option on the screen menu. You can choose a Template by clicking on the drop down arrow key to the right of the Templates field. 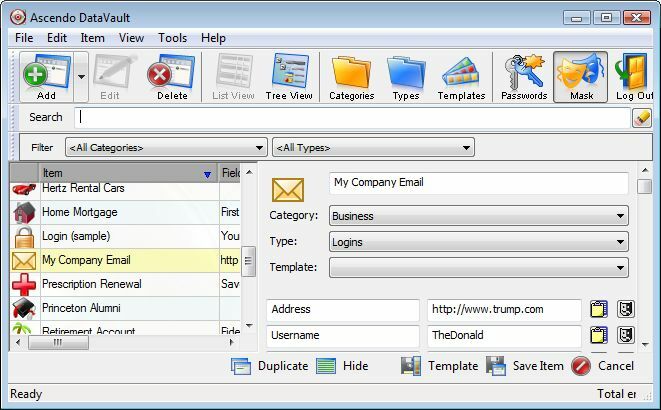 A set of predefined templates such as Visa, Email, etc. will appear. If you select a template, the icon associated with an Item and the field labels will be changed. If you just want to change the icon associated with an Item, click on the right arrow button next to the icon. If you click on the Save Template button then the icon and field labels will be saved to the Template name of your choice and can be reused with other Items. Once you have created several items you may find yourself with a List View resembling Figure 20. If you are not already in List View, click on the button labeled List View, third from the left along the top row of buttons. The List View screen provides the quickest way to look-up and display options. When you enter the List View screen a blinking cursor will appear in the Quick Search field. If you start typing characters, the list of items in the left hand panel will be reduced to only those items containing the search string in the item name. For example, entering "c" would display "Ascendo DataVault" and "Blue Cross / Blue Shield" but not "Blue Miles". To clear the search field, click Escape or the pencil icon to the right of the search field. To show the details of another item in the right hand panel, click once on the item row in the left hand panel. If you wait a second then click on the row a second time, the field under the cursor will become editable. To edit the entire item, click on the Edit button along the bottom of the screen. Clicking on the Hide Details button at the bottom left hand side of the screen, removes the detail panel from view, see Figure 21. You can also Hide Details using the shortcut ALT-V H. Once clicked, the button label changes to Show Details and can be pressed again to display the details panel. All field values can be modified directly in the list. To modify a field, click once to select the row and a second time to change the field to editable. If you want to show all fields and the notes section you can resize the application window or resize the fields. Category and Type filters are displayed directly below the Quick search field. When you enter the List View screen, the Category and Type will be set to All. To display only the Items in a specific Category or Type, click on the down arrow next to the corresponding label and choose from the elements in the drop down list. Each column in the left had panel can be ordered alphabetically. To order a column, click on the column header ("Item | Field 1 | Field 2,..."). Click again to change the order to reverse alphabetical. A small blue arrow will appear in the header field to indicate in which direction the field is ordered. The left hand panel and the field widths can be resized by clicking on the right edge and moving the cursor to the right, then releasing the cursor. If the items list is bigger than the panel, slider bars will appear along the right and bottom edges allowing you to scroll vertically though the items or horizontally through the fields. The Tree View provides an intuitive way to display your information according to Categories and Types. When in Tree View, items are displayed as the third level in a tree where the first level is Categories and the second level is Types, see Figure 22. To display items in Tree View, click on the button forth from the left along the top row of buttons. You can drag & drop items from one type to another, or types from one category or another. To drag & drop, position the cursor over an element, click on the left mouse key, move the cursor to the element you want to drop it in and release the left mouse key. If a Category or Type has an open folder to the left of it then you can Collapse that level of the tree to hide the information below it. For example, if you collapse the "Business" category, Bank Accounts, Logins and the items they contain will no longer appear. To collapse a level of the tree, double click on an open Category or Type. A closed folder indicates that there are items beneath a branch that do not appear on the screen. If folder next to the Business folder is closed and you double click on it, Banks Accounts, Logins and associated items will reappear. You can choose to use a minus sign "-" instead of a closed folder or a plus sign "+" instead of an open folder from the Tools > Options menu. To expand all the branches in the tree, select Expand All from the View menu or use CTRL-Shift-E as a shortcut. To collapse all the branches in a tree, select Collapse All from the View menu or use CTRL-SHIFT-C as a shortcut. DataVault provides an Option to set a Default Tree Display which determines what the tree looks like when you start the application or switch to Tree View. The choices are Expanded, Collapsed or Last which means that DataVault will remember which levels were expanded or collapsed the last time you exited the application and return to that tree formation. When you install Ascendo DataVault Desktop a plug-in will appear as a toolbar the next time you start your internet browser, see Figure 23. 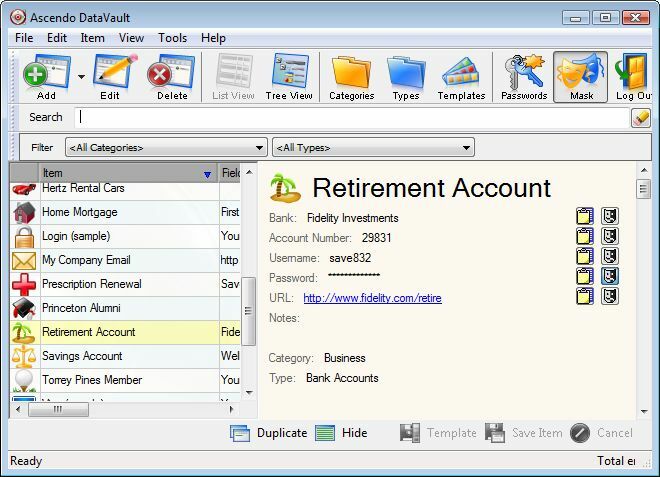 The DataVault toolbar appears directly below the main toolbar and contains icons for Web Items, Save Form and Generate Password. Field values stored in DataVault that contain internet addresses beginning with "http://" will be stored as live links to web sites. If you click on a live link, DataVault will start your browser and open the page. DataVault can automatically fill (auto-fill) fields in a web form such as password and username. 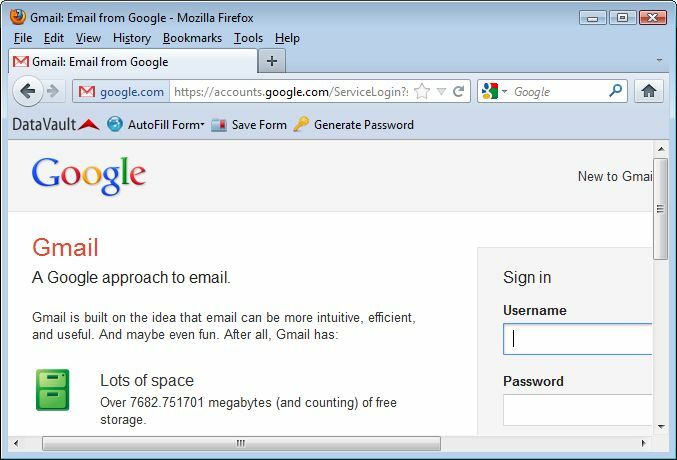 For example, you might create an item called Gmail with fields for the login page, username and password. If you click on the address (URL) for the login page, DataVault will open your browser, go to the login page and auto-fill the username and password. To auto-fill a form you must enter label names into DataVault that are the same as the field label names used internally by the web site. These may be different than the web site screen labels and there is no easy way to find them apart from viewing the source code for the page. To simplify the process, DataVault provides a Save Form feature to create items directly from web pages with the information necessary to auto-fill a form. To use the Save Form feature, go to a web form and type in field values, see Figure 23. When you have typed in all the fields you want to save, click on the Save Form button in the DataVault toolbar. DataVault will create and display a new entry with the page title as the item name and the field labels/values necessary to auto-fill the form. You can Edit, Save or Cancel the item in DataVault. If an Item already exists with the same URL, DataVault will ask you if you want to overwrite the item. To access DataVault items for internet sites, click on the Web Items button in the toolbar. A drop down list of sites will appear beneath the button. Click on a site to go to the page. 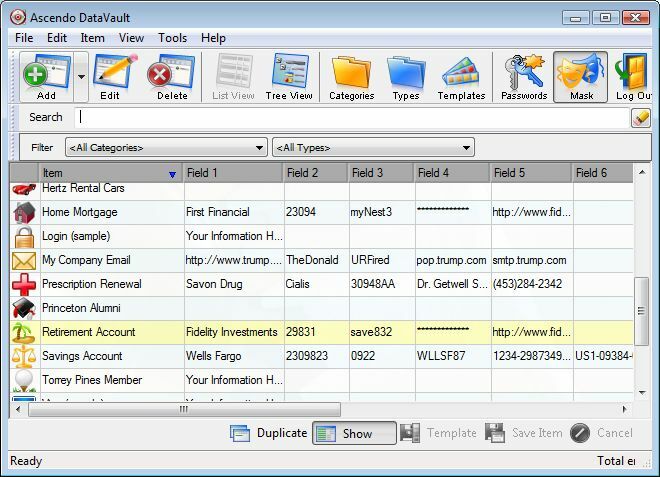 The DataVault tool bar includes a button to Generate Passwords. When you click on the button a dialog window will appear with a randomly generated password and several options, see section on Password Generator. There several ways to configure the browser integration features of DataVault. To display these choices, click on Tools in the main menu and select Options from the submenu. The Web Form Login setting under Browser Integration determines whether on not DataVault will simulate pressing Enter/Return after auto filling a form. If you select Automatic, DataVault will manage the login process from beginning to end with only one click. However, web sites use several methods to manage the Enter/Return key and DataVault may not work with all sites. For this reason the Web Form Login button is initially set to User Initiated. The Form Field Entry setting controls whether DataVault will automatically enter field values each time you go to a particular web form. If you set this option to Automatic, the form will be filled whether or not DataVault is running. If you set the option to User Initiated, you must start DataVault and click on a live link to auto-fill a form. Another way to use auto-fill without having to start DataVault Desktop is to create a Windows desktop shortcut. You can create a shortcut by right clicking on an item and selecting "Add shortcut on Desktop" from the context menu. The DataVault Desktop provides options to Backup & Restore your data. When you backup you items with DataVault, your information is password protected and encrypted using Advanced Encryption Standard (AES) the official standard chosen by the US Government. To Backup Items, click on File from the main menu select Backup. Select a file name and confirm or click on the Browse button to select a different directory. To Restore Items, click on the File menu and select Restore. You can set an Option from the Tools menu to create automatic backups. The files will be stored in a directory called "\Automatic backups" off of the directory you chose to store the DataVault.dat file with you items. The setting for Automatic Backup Count controls the number of backup files that DataVault will create before deleting the oldest files.